Since all PEX tubing used in the US is manufactured to the same ASTM and dimensional (SDR) standards, these specifications are universal. Manufacturing tolerances and other details can be found in manufacturers’ manuals. * Numbers are approximate as per ASTM requirements. Dimensional data is subject to manufacturing tolerances and may vary by brand. Same data applies both to oxygen barrier and non-barrier PEX. 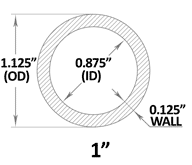 PEX tubing sizes are denoted by CTS (copper tubing size), not OD (Outside Diameter) or ID (Inside Diameter). 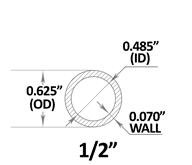 OD of PEX, copper and CPVC pipe with the same size (CTS) is the same. This is why push fittings can be used with all of these pipes. 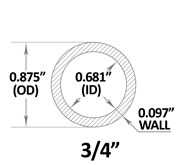 PEX made to US standards must comply with a SDR-9 (Standard Dimension Ratio), which is the ratio of OD (Outside Diameter) to pipe wall thickness (9:1). Exceptions are nominal sizes 1/2" and below. 74°F at 160 psi 3 times the maximum working pressure or a minimum of 40 psi, but no greater than 100 psi. Duration: 30 minutes minimum, 2 hours recommended 1.5 times the maximum working pressure but no greater than pipe’s pressure rating at given temperature. Maximum working pressure indicates highest anticipated operating pressure. Pressure testing requirements and procedures should be in compliance with local codes and PEX manufacturer’s instructions. Air pressure testing is recommended over water for practical reasons and due to difficulties arising from water freezing during winter months. Since PEX is a flexible pipe, it will expand somewhat (especially PEX-a) during the initial pressurizing of the system, causing a drop in pressure reading. Some manufacturers recommend "conditioning" of the system, or allowing the PEX system to stay pressurized for about 30 minutes prior to taking a reading. For concrete slabs, pressure is maintained at 30 psi during the pour and is monitored to assure integrity of the system. (8 x OD). 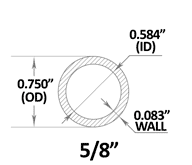 For 1/2" PEX with OD of 5/8", minimum bending radius is 8 x 5/8" = 5". Over-bending the PEX pipe, deforms its’ round shape, restricts flow and over-stresses the pipe. 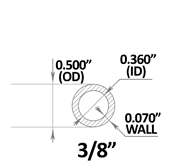 Note: minimum bending diameter only refers to the 90-degree and 180-degree (U-shaped) bends. Parallel runs of pipe can be spaced as close as necessary. Typical elongation is anywhere from 1" to 2.5" for every 100ft of PEX pipe at a 10°F temperature rise. Since PEX expands and contracts with temperature changes, it should be secured so as to provide sufficient space for expansion to occur. Crimp system: Crimp Tool + Copper Crimp Rings (per ASTM F1807 standard) + Crimp style PEX Fittings (brass – per F877/F1807 or poly – per F877/F2159 standards). Clamp (Cinch) system: Clamp Tool + Stainless Steel Clamps (per ASTM F2098) + Crimp style PEX Fittings (same as above). ASTM F876: Standard Specification for Crosslinked Polyethylene (PEX) Tubing. ASTM F877: Standard Specification for Crosslinked Polyethylene (PEX) Plastic Hot- and Cold- Water Distribution Systems. ASTM F2023: Oxidative resistance of PEX to Hot Chlorinated Water per NSF protocol P171 (Non-Barrier PEX Tubing). CSA B137.5: Crosslinked Polyethylene (PEX) Tubing Systems for Pressure Applications. NSF/ANSI 14, nsf-rfh: Evaluated for use in Radiant Floor Heating (NSF-rfh) Applications (Oxygen Barrier PEX tubing). NSF/ANSI 61-G, NSF/ANSI 372, nsf-pw-g: Complies with NSF/ANSI standard 61-G for Lead-Free Drinking Water System Components (Non-Barrier PEX Tubing). UPC listed by IAPMO (International Association of Plumbing and Mechanical Officials).